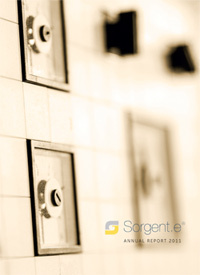 Sorgent.e’s shareholders meeting approved the Consolidated Financial Statement as of December 31, 2011. Total consolidated revenues increased of 19% with reference to the previous fiscal year, EBITDA increased of 21% and the net income grows with a +18%. The consolidated total assets have grown thanks to the entered in operation of new hydroelectric power plants in Italy and abroad, and in the meantime the shareholders equity of the group has increased from the previous fiscal year of +69%. In addition to the improvement in those markets where Sorgent.e has already been working, the expansion in growing markets such as Africa, Asia and South America has to be emphasized, with the opening of agencies in China, Armenia and Perù. The staff team has increased of 24 units, considerably extending its involvement abroad. With an average age lower than 36 years, Sorgent.e has decided to invest on a young and smart working team, strongly determined to grow and acquire experience in different fields and markets. Eventually, as a basic data, the positive energy balance, determined by the direct production of Sorgent.e’s plants, allowed the supply of energy to 80.000 family units and a total energy saving, considering hydroelectric, wind and PV plants, of more than 460 ton of Co2.s.